The brackets for Day 1 of the 2017 Junior Greco-Roman World Championships were released earlier today and the four US athletes going seem to be sitting in pretty good position, or at least in as a good of a position as possible considering the depth at this thing. At 50 kilograms, Cevion Severado (Xtreme RTC) will be taking on Maksym Vysotskyi (ISR), who last competed at the Maccabi Games. In fact, Vysotoskyi was defeated for bronze in his home country by former US National Team member Nate Engel, who came out of retirement to compete in that event. Should Severado get past Vysotskyi, he will have either Dominic Dudzinski (POL) or Mykola Stepaniuk (UKR). 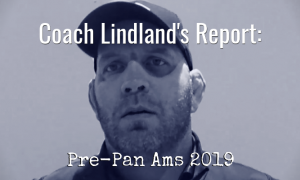 Dudzinski won one match at the Junior Euros in June, a criteria decision over Stepaniuk’s countryman Konstantin Sobolevski, before getting tech’ed out by two-time Nordic Championships winner Nikolai Mohammadi (DEN), who wound up fifth. Vysotskyi is a bit lanky and does press in, but will also break away from tie-ups he doesn’t find to be favorable, which could be an advantage for Severado provided he has his foot on the accelerator. Vysotskyi is not going to get away with backing up and Severado’s fluidity and speed might allow for some critical opportunities to present themselves. It’s a tall order (almost literally), but as good of a draw as a first-timer is going to get. 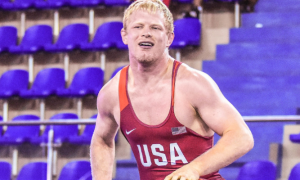 Taylor LaMont (60 kg, Sunkist/UT) has himself a tough first-round assignment in 2015 Cadet World bronze medalist Maksim Nehoda (BLR), who we last saw giving 2016 Cadet World Champion Leri Abuladze (GEO) an extraordinarily difficult time at the Junior Euros. In that bout, Nehoda was constantly in Abuladze’s face. It was a grinding, pummel-happy, tense match, the kind Nehoda seems to like. Nehoda will go bent-waist here and there on the feet to slip in underhooks and he doesn’t seem to fade. His medal run at the Worlds in 2015 included one of the coolest throws of the tournament when he improvised on a straddle lift against Arslan Abdurakhmanov (KAZ) in the quarters, for those who remember that. LaMont is a better all-around wrestler and athlete than Nehoda, but being from Eastern Europe and growing up your whole life wrestling primarily one style has its benefits. It sounds obvious, but LaMont is going to have to beat him his own way and try to be a commanding force in the tie-ups, walking Nehoda down step by step into the second period. If you’re thinking of LaMont as a potential champion here, and you should be, then it’s not who’d have next if he wins, but who he would have in the semis, and that’s Abuldadze, the presumed favorite. Kamal Bey (Sunkist) is, on paper, set up well in the 74 kilogram bracket. He’ll have Korean newcomer Pikeun Bong in his qualification round match-up. We can’t find anything on Bong that is relevant enough to mention, so just assume that like most Korean Greco guys, he’s going to be coming forward and bringing spritely pressure. That plays into Bey’s wheelhouse big-time. If Bey moves on, he will have the winner of Karan Mosebach (GER) and Victor Buzu (MDA). Again, not much here other than that Buzu was a Cadet World Team member a few years ago. 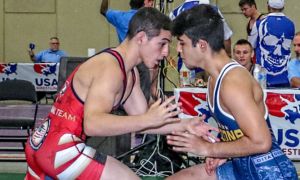 Elsewhere on Bey’s side of the bracket are 2016 Cadet World silver medalist Nasir Hasanov (AZE), who he could have in the quarters. From there, potential match-ups with either Junior Euros bronze Beka Mamukashvili (GEO) or 2015 Cadet Euro champ Islam Opiev (RUS) await. No one on Bey’s side of the bracket is certainly out of his reach in any fashion, so if he is operating on all proverbial cylinders, it is hard right now to not picture him in serious contention for gold. Finally, G’Angelo Hancock (96 kg, Sunkist) will be opening up his morning with someone who is a familiar face to him, Switzerland’s Damian Von Euw. 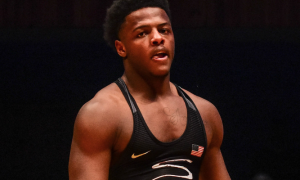 Von Euw took fifth at the Junior Euros and he and Hancock have shared mat space together before. The two tangled at the Austrian Open in March with Hancock coming away the decisive winner and they have also worked out with one another apparently, if that means anything. It’s crowded in Hancock’s bracket, which is the bottom half. A win over Von Euw would mean either Tehran Aminzade (AZE) or Kiril Mile Milov (BUL). 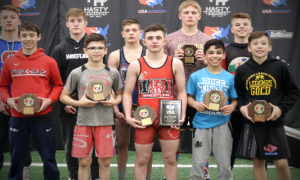 For bookkeeping’s sake, both took fifth at the Cadet Worlds. But it is dicier elsewhere. 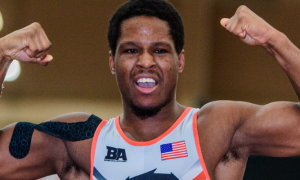 If Hancock makes it into the quarters, he could have 2017 Junior Euro silver Suleyman Erbay (TUR); 2015 Cadet World silver Robert Ersek (HUN), who has started getting involved more as a Senior; or 2017 Junior Asian Championships gold medalist Temur Mamajanov (UZB). Hancock is expected to fly past Von Euw and though Aminzade (who Hancock has probably also trained with previously in Azerbaijan) and Milov are tough, the latter a little more aggressive than the former perhaps, he should be able to fight through to the quarters. That’s when it will be crunch time. However you want to break it down and slice it up, Hancock has too much going for him currently and should be considered the man to beat heading into the afternoon. *We will be providing live updates on Twitter throughout the day with recaps following each session. Wrestling begins at 10:00am local time (3:00am EST) on Trackwrestling.com.